Shipping within Germany is free of charge for orders over 50 €. We charge 4.95€ shipping for all orders under 50€. Book orders are delivered free of charge. All orders are shipped with DHL and are insured for a value of up to 500€. After receiving your payment, on-stock items are shipped within 2 business days. This does not include the actual delivery by DHL. DHL normally requires approximately 3 to 5 business days for delivery within Germany. If you would like to receive your order more quickly, then please select oneday eXpress delivery when ordering. The award-winning Buggypod Perle is a perfectly designed seat that clips onto your Lascal Buggyboard Maxi or Bugaboo Wheeled Board to give your toddler a smooth ride when they get tired. And all in its own neat, clamshell case which opens up to form the backrest and base of the seat. 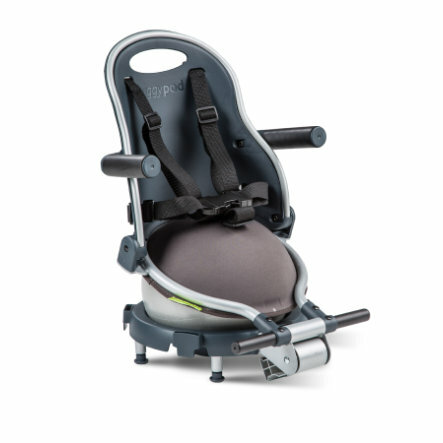 When out with friends in a cafe or restaurant just clip Buggypod Perle off the wheeled board and attach it to a dining chair for use as a booster seat so your toddler can join in the fun. Also perfect for holiday travel or at home. Your toddler will love the fun and comfort of sitting on the in-built mini gymnastics ball (included). We ship your order to the address of your choice. It does not need to be the same as the invoice address. If you are not at home during the day, you can have your parcel sent to your working place, a friend or relatives. If you are not present at the time of delivery, our logistic partner will usually leave your parcel with a neighbour or in a deposit nearby. In this case, a note will be left in your post box. Our Service Team - our service team helps you at all times! We will be happy to answer questions you may have on our products. Contact us if you have any questions by sending us an email at info@baby-markt.com or call our service hotline +49 (0)231 - 53471293 (Monday-Friday 8am to 5pm). eKomi develops and operates intelligent feedback systems. Using social commerce technology, eKomi collects customer feedback, product reviews, comments and recommendations. These are used to provide more transparency and safety for e-commerce customers. Only companies that have installed the software developed and authenticated by eKomi can survey customers and use the eKomi seal of approval after a certain number of customers have left reviews. eKomi ensures that the eKomi reviews are exclusively submitted by customers who have actually placed an order with the seller. You can thus only rate the seller, if they are eKomi customers and if you have placed an order with them. Don't miss any promotions, coupons and the new products! baby-markt.com subscribe to the newsletter. We are happy to assist you! Your babymarkt customer care will be happy to assist you. Please enter your contact information and your message.